Today...one of my favorite friends, Natalie, is sharing 5 easy steps to creating the outdoor space of your dreams! Pay attention y'all...this lady knows her stuff! I'm inspired! Hello & welcome! My name is Natalie. I find joy in the everyday moments & share them on my blog. I am happily married to my husband & together we have a family of two sweet pups & a flock of chickens. We have a deep passion for living fully & simply in our home. We cook from the harvests of our garden & prefer old things to new. I was so excited when Sara asked me to feature one of our favorite spaces in our home- our front porch! I believe everyone should have a cozy, colorful spot for drinking coffee in the early morning hours & gathering for a meal with loved ones in the summer months. Today I am here to share some inexpensive, fun & colorful tips on making your outdoor space a little more delightful! The first day we moved into our home, I hung twinkle lights on our paint-chipped porch. I love the soft mood of outdoor lighting in the evenings while enjoying a meal made from scratch. You can purchase string lights at Target & most big box stores for less than $15 a string, but I purchased several strings of lights at a thrift store for under $2 a box. Wait until after the holidays & most outdoor lighting goes on sale. You can also use christmas tree lights for the same effect. I also believe what's beneath your feet is key to adding a colorful, fun feel to your outdoor living space. Just as you enjoy an accent rug underneath your couch or kitchen table, a rug under a bench, swing or metal chair outside provides a funky feel. I thrifted both of our rugs for under $10 each. Both of the pieces above were found at yard sales for less than $3 each. With a can of spray paint, I added a unique spin to our outside furniture. The key is to have furniture that is comfortable & serves your hosting needs. You can always update the furniture with a bit of paint! The key to really living in our outdoor space is having a table where we can craft, read books, browse magazines & enjoy a delicious meal together. On most nights, you will find us outside on our porch eating dinner or talking about the day's events. We don't have a television in our home, so a lot of our time is spent outdoors, which we love & cherish. We actually found our table for free in a friend's backyard. I cleaned it up, painted the top & used some inexpensive wooden chairs we already had. If you don't have space for a full size table, a metal or wooden coffee table beside a chair would work wonderfully for holding your favorite drink & a good book. Oh, we love adding whimsical patterns & punches of color to our outdoor space! I recently purchased the colorful flags from party city for under $5. 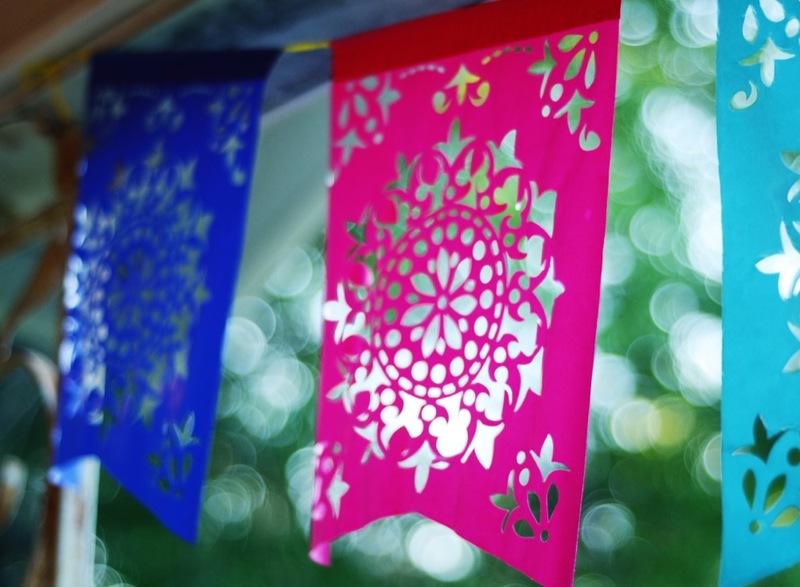 Homemade bunting & prayer flags are great options, too. We also enjoy adding crocheted blankets to our bench for cool evenings & throw pillows to chairs. We thrifted & handmade most of the blankets & pillows for our porch & I love that about this space. I believe plants should be in every room & what better place than your porch! We love adding hanging pots full of flowers & terra cotta pots of beautiful succulents. I love getting creative with pots. We turn old & rusty barrels into planters & hollow stumps into the perfect spot for growing mint. With a small budget & a bit of creativity, you can have a front porch that is just as functional & lovely as your indoor living room. If your outdoor space does not have a roof, you can still have a green space full of potted plants with a handful of colorful chairs for hosting! A big hug & thank you to Sara for allowing me to share with you one of our favorite spots in our home! And now...we want to see YOUR outdoor space! Post your photos to Instagram with the hashtag #createaspaceyouloveoutside. A note from Sara: Be sure to check out Natalie's blog (it's one of the few I read on a regular basis!) and her Etsy store. I am OBSESSED with her film photography postcards. I use them for letter writing, decorating the top of a gift, for framing...you name it. Natalie is graciously offering a 25% Etsy discount to my blog readers! Use the code LIVEWILDLY25OFF for the next week.